And as street children often it takes them a long time to tell their life story, but I hope one day he will let his heart flow and we will be here to listen to him and share with everyone. Daniel is not a talkative person, his life is so quiet but he has his ways of enjoying his life and he is able to make friends. Daniel finished hair dressing training, and he has no opportunity to do mechanical training as he desired but still he says it’s okay. He went back to school and began in primary six where he had stopped when his father died. 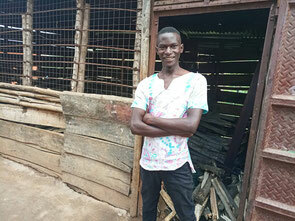 The idea of going back to school was set in him by his friend and sponsor Saya from Netherlands. But Daniel did not feel comfortable to sit in a classroom with younger children to him. He failed the school in only two week time although by that time all school dues was cleared for him by Saya. His friends started borrowing his money but they never paid back, he felt bad and got the stress. At some point things were not well neither easy for him but SAVO just kept quiet and watch him silently to see how he fight through. At the end of the year he was fully changed and learnt that many friends are not good. He started going to church to praise the Lord on Sundays. He started visiting the church more often, he cut off his hair and changed his dressing code. Now Daniel is a changed young man in his daily life and spiritual life. After 4 years of stay at SAVO house on 1st February, 2018 Daniel was graduated from all SAVO care programs. When Daniel grew to 18 years SAVO helped him to start preparing his life to live as an independent person. He started a small chapatti business and started to earn some money. After 8 months of business he was able to hire another person to help him on the business. In these few months since he left SAVO house his life in the community has been good and fully grasped the situation there. He is currently working hard to expand his business and we believe in him to become a strong business man in future. We thank all the individual people and organizations from Japan, USA, German and UK who have supported SAVO which helped these young people forge out their future. 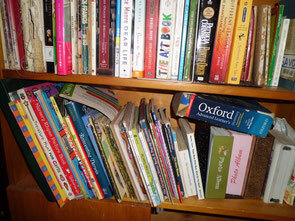 Literacy for inspiring development: Is designed to provide access to books to the young people. We believe this will help them acquire more knowledge and pick interest to become writers in future. SAVO house is aiming at setting up a well equipped public library center for children because there is no such a center in our community and the region at large where young people can gather for the purpose of leading books to add on their knowledge. It is very true that most schools have no libraries and if one has, there is not enough books and space for the children to read. This has limited children to access information and knowledge written in those books. Our target books are novels, story books and text books of school curriculum. This will help to promote literacy and development. Basic education for the children and literate Adults is the backbone of the community in development, since education contributes to the reduction of both absolute and relative poverty. Geographically Sub-Saharan Africa has the highest rates of illiteracy recorded at 71%, compared to the global rate of 91% (UNESCO). Basic education, in particular, helps to alleviate poverty by helping poor people improve their standard of living. Mothers with some education raise healthier families. Children and youth who can read and handle numbers, gain access to information and thinking processes that give them more choices about how to behave in their families and the community. Adults can make more informed decisions about political and social events that affect the quality of their living standards. As reading may not be fun for these children alone, the library guide staff shall be available to read for them as an inspiration and to boost their morale in reading. We believe that after a short period of time these groups of children shall be able to read by themselves and later read as individual persons. We shall make the parents themselves love this project and we plan to bring them together at the initial stages of the project and listen as we read inspiring stories for their children. And later we shall be setting up days and invite the parents/guardians to listen to their children as they read. This will help both children and their relatives to love, support and feel it as their own project which is established to help them become better people. We shall be charging a small/affordable fee as the community contribution to maintain and for expansion of the project as it’s our vision to establish a big public reading center. We so much at this stage send our sincere appreciation to one of our Family (SAVO Family) Ms. Naomi Owaki from Japan who have donated one by one of the current number of books we have. We request for more donation of books. And for phase one we are looking for one thousand copies of books. Please donate any book to help this project stand.